BC Register: first name transcribed as Arthur. A donation to the memorial statue has been made in honour of this soldier by a fellow Old Brightonian and 2015 leaver. Schiff entered the School House in May, 1912. He distinguished himself as a cricketer at the College, getting his Junior XI. colours in 1912, Second XI. in 1914, and First XI. in 1915. The following extract from a letter of a senior officer will interest all O.B. 's who knew him:- "It will be a great comfort to know what a splendidly gallant end his was. Our objective on Monday was - Redoubt, some 6,000 yards behind the German lines. We had been practising for the attack ever since he joined us, and he was keener than any one. We soon knew the order of battle and my Company was leading. We attacked on a two platoon front - his platoon was on the right and directed the whole battalion in the attack. Ours was the furthermost objective on the first day. We had seen aeroplane photos of the Redoubt. There was a trench leading east away from the Redoubt towards the Germans. We were always talking about the attack of course, discussing what to do and all about it. Your son's job was to go straight across the Redoubt, consolidate strong points on the other side and put up a barricade in this trench. He was always talking about this barricade, and what a jolly good one he was going to make. The right hand corner of this triangular Redoubt was called 'Schiff's Corner', this being the corner which would probably be reached first and which his platoon would go over. He had the map reference on the back of his identity disc. On Monday, the battalion started from camp about 6.20 a.m., and marched to their first assembly position. Our attack did not start until 3 in the afternoon. The battalion went through the objectives gained by other divisions. The attack went off just as we had practised it - No.11 platoon leading and directing. They kicked their football right into the Redoubt, advanced over it and started consolidating. He made his barricade. One of his Lewis gunners was firing at some retreating Germans, but that was not enough for him. He seized the Lewis gun and started firing it himself, when he was shot through the heart by a German sniper. It must have been quite instantaneous. He died having done his job and done it splendidly, and you can well be proud of him. He is a very great loss to the battalion, and the company won't be the same without him. He was always so immensely cheery and keen and we were all so fond of him. All his men loved him, and on the night before the attack, when I was going round wishing them all good luck, many of them told me that would follow him anywhere." Born in 1898 he was the son of Ernest Wilton Schiff and his wife of 8 Clarges Street, Mayfair, London. The name Schiff suggests ironically suggests some German ancestry but both he and his younger sister Esme shared the middle name Borlase, which maybe surmised to be a family name, which has Cornish connotations. His family circumstances were later complicated by his parents, unusually for the era, divorcing. His sister Esme later married the rather grand Lieutenant Colonel Edward Douglas Montague Hunter Cooke and had three daughters. Alfred Schiff entered School House as a boarder in 1912 (his fourteenth year). His primary achievements at school were sporting, in particular his membership of the 1st Cricket in the summer 1914 and summer 1915 seasons. Over a total of six matches he achieved a batting average of 19 runs and a total of 8 wickets. 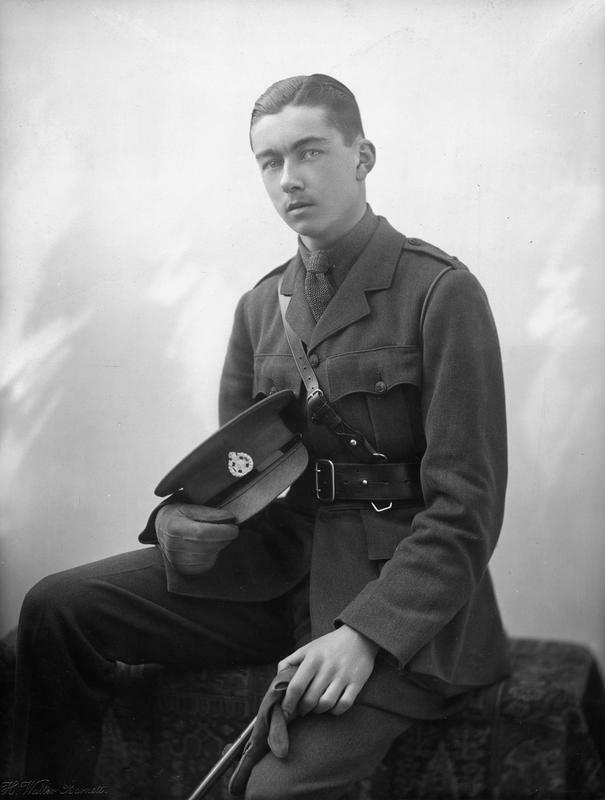 However it appears that his school career was cut short when he left the school to join the army, or rather to enrol at the Royal Military College, Sandhurst aged 17 for which he passed the army entrance examination in June 1915. Interestingly we have provided with all the medical reports made on his application to the RMC, which give an indication that in theory at least to the standard of physical health and fitness required of officer recruits was exacting, despite the frequent stories of officers, such as Rudyard Kipling’s son Jack being admitted with obvious physical difficulties. His medical report on application for entry for Sandhurst reveals that he was 72 inches tall, i.e. he was what would be now termed a ‘six-footer’. In the context of the era, when the average male height was 66 inches or less, this indicates that he was definitely something of an athlete. He was, however, slim for his height: weighing in at only 10 stone 8 pounds with a chest width of only 36. He also signed a declaration affirming that he was not ‘suffering from any mental or bodily infirmity’ and that he had ‘never suffered “fits” of any description’. Despite being given a very full bill of health on admission to Sandhurst, however, he was admitted to hospital while at the front for a few days in January 1917 for a nasal illness, an indication of the way that the unhealthy nature of trench life debilitated those obliged to serve in them. In 1916 Alfred Schiff was commissioned as a Second Lieutenant in the Rifle Brigade, a relatively senior infantry regiment in the British Army with a strong tradition of soldiering dating back to the Peninsular War. At the Battle of Arras in April 1917 the 1st Battalion Rifle Brigade was involved in the initial attack. It was on the 9th April 1917 that 2nd Lieutenant Schiff was killed in action. Unusually there is relatively little documentary evidence as to how exactly he died, although it is clear that he was killed fairly instantly rather than dying of his wounds later. Having been killed aged only 19 he left very few personal effects and an estate amounting to only Five Pounds, Three Shillings and Four pence. The settlement of this estate appears to have been slightly complicated by the fact that, very unusually for the era, his parents had by this time officially separated, and his father had taken up with a ‘Mrs Moxon’. Sadly his new relationship was not to last for long because, perhaps weakened by his grief for his only son, Alfred’s father died in 1919.